Dana Slayton, a National Security Language Initiative Youth (NSLI-Y) program participant, is the October 2017 American Abroad Student of the Month. 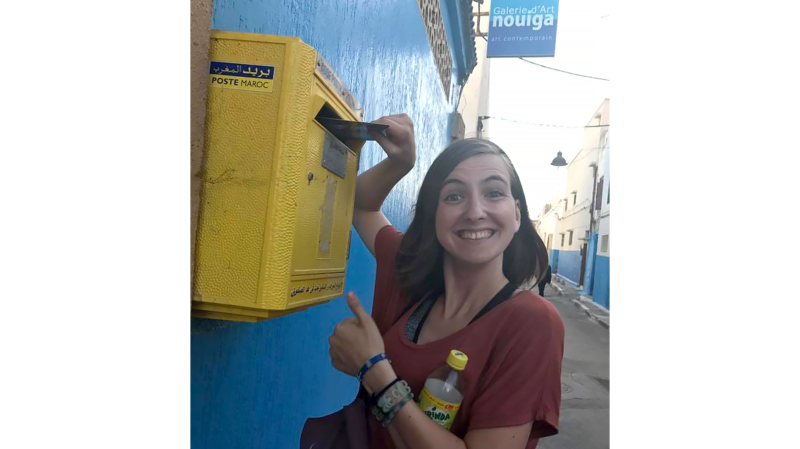 From Virginia, Dana is almost half way through an academic year abroad of cultural exchange and Arabic language instruction in Rabat, Morocco. Dana Slayton, a NSLI-Y student, has been excelling during her time in Morocco! Coming in with an advanced level of Arabic language, she has been working tirelessly to further strengthen her Arabic language skills. With her NSLI-Y teacher, Dana has committed herself to expanding her vocabulary, improving her reading skills, developing her essay writing, and developing fluency in both Modern Standard and Moroccan colloquial Arabic – a very difficult task for a non-native speaker. Dana is challenging her advanced level of Arabic by attending 4 hours a week of philosophy class at a local Moroccan high school (and loving it!). She has also gotten permission to sit in on a graduate-level Applied Linguistics class with one of her language partners at Mohammed V University. On top of all this, Dana has volunteered 26 hours this month as an English teaching assistant, and she has written a number of songs in English and Arabic about her experiences in Rabat. She even performed some of these songs at a local open mic night at Café Renaissance, a popular café, movie theater, and performance space in central Rabat. Dana has clearly fully immersed herself in the NSLI-Y experience. We can’t wait to see what she will do in the second half of the program. Congratulations, Dana!